Well, we have the nursery completed.....now all that is needed is a BABY. We have about 3 weeks to go until we get to meet this little guy. It's amazing to think that he is this fully-formed baby just growing fatter and fatter everyday until he runs out of room and decides to make his appearance. It's all pretty fascinating and exciting. Tony and I are overwhelmed at the amount of love everyone already feels towards him; we've had two baby showers, countless gifts and unending well wishes. 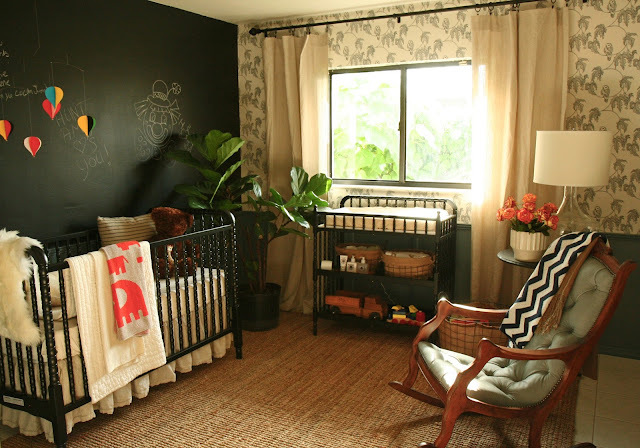 We didn't want the nursery to scream "baby"! but at the same time be a comfortable and unique place for him. I fell in love with the owl wallpaper as soon as I spotted it. I mean, what is a better excuse to wallpaper a room than in a nursery! It's by a London based interior design company that decided to add a line of wallpapers inspired by hand sketches. You can view all the other prints and patterns at Turner Pocock. We also thought it would be cool to do an entire wall in chalkboard paint. It's been fun reading everyone's messages and drawings. The mobile over the crib is from a Danish company that does brightly colored paper mobiles. I like that it isn't plastic or "fuzzy" or made in china. It also moves with just the slightest breeze. You can check out all the other mobile options here. 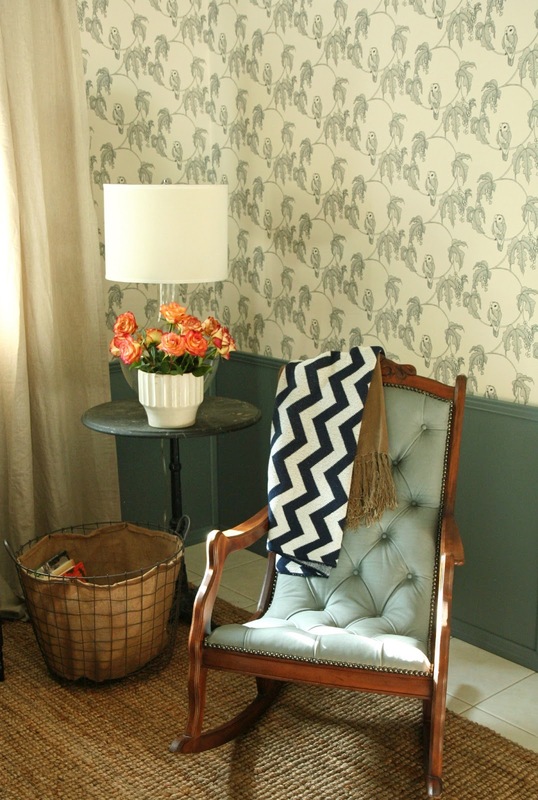 The toughest part of the nursery was by FAR the wood chair molding. It involved many trips to Home Depot, one where we had to rent one of those trucks because we couldn't fit the huge wood panels in the back of our car. We cut each panel, all the top trim and bottom trim as well as the pieces that make up the "boxes". Once they were all cut, we painted it a slate-blue color. There were many nights we just looked at each other and thought, "what the heck were we thinking"?.....but in the end, it's one of my favorite details of the room and it feels really good to know that we did it ourselves. The rocking chair is an antique that my mom and I picked up on a trip out to Arcadia,Florida (if you're into antiques I recommend a trip there). That old rocker got a major face lift! My mom striped the wood and refinished it. I had it reupholstered in slate-gray leather with nail head trim. By the way......if you love the color of the leather, it will be an option in the C.Blau handbag line for Fall 2013! 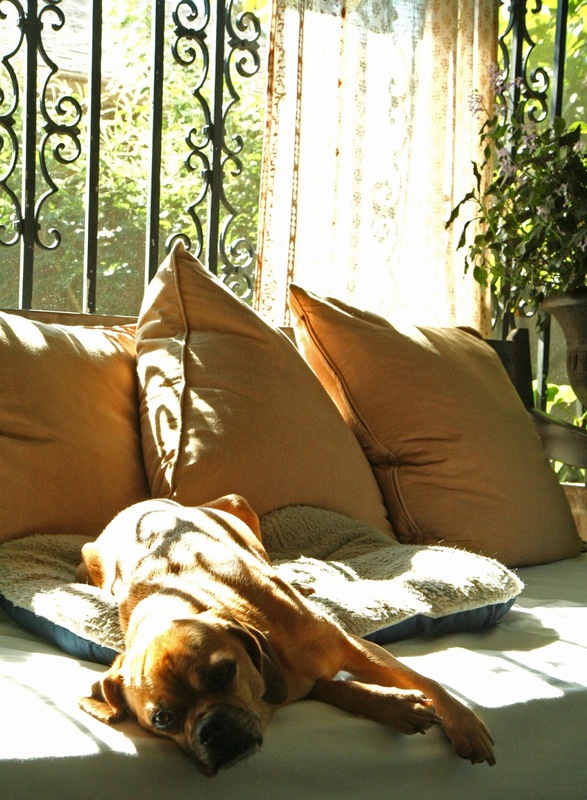 I also wanted the nursery to be puggle friendly. Afterall, Olive will probably be spending many of her nights in here as well! 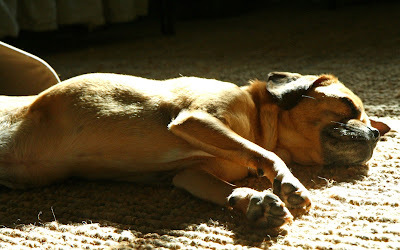 Most mornings she goes in and finds the biggest patch of sun and takes a nap. I just hope the baby finds his room equally relaxing! The term "nesting", when referring to a soon-to-be mother, always sounded funny to me. I guess it makes me think of my family's pregnant cat; she would tear up pieces of paper and frantically stuff them in a pile in the cardboard box we provided for her. Maybe "nesting" sounds too literal for me. Or too all-consuming. I've been lucky enough to live in a place where the cold hasn't kept me indoors. 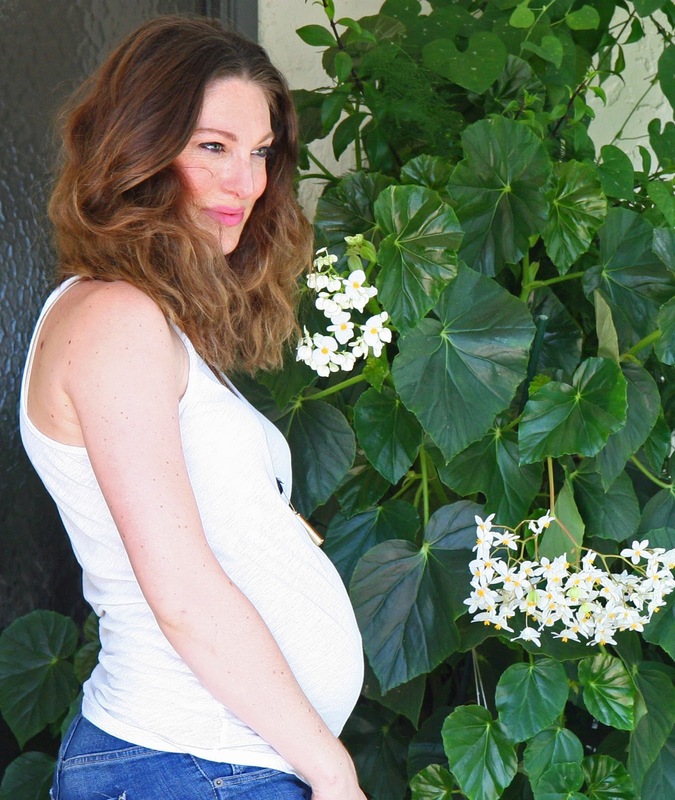 I haven't had to be cooped up in the house obsessing over every part of being pregnant. Most mornings I eat my breakfast outside and have a moment of peace and quiet to spend with the little human growing inside of me. I talk to him. Simple things like, "looks like we're out of Cheerios, guess it's going to be oatmeal this morning", or "oops, we spent too long watering the plants, now we're going to be late for work!". In a way, I feel like I'm already getting to know him.......the much quieter, non-diaper changing, "I get to still have a normal night's sleep" version of him. So I'm sure all the mothers out there are saying......."just you wait!! you have no idea what's to come!". And I really don't. And I don't expect to. I'm hoping that my husband and I will be able to adapt to the HUGE life change that awaits and take it day by day. In the words of my mother, "blessed are those who are flexible". In the meantime, I'm just enjoying every kick, squirm, ache and pain that this little boy brings me. So back to nesting.......I've decided to post a picture of the nursery the way it looks today. 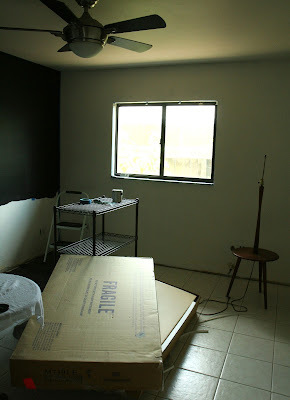 Yes, we have put up chalkboard paint on the one wall, but that seems to be about it. My husband would probably disagree because in order to get the room to look like this, he had to rip out the baseboards, skim coat the walls, sand, then skim coat the walls again. It seems like a lot to do in order to get a room "ready" to be "ready". But, here we are........and I couldn't be more excited! While some may think this looks daunting or overwhelming, I see it as a world of potential! So many options of paint, wallpaper and ideas! This is the best time for a room, when you can clear everything out, clean out all the hidden dust bunnies, start fresh and create any mood and feeling you want the room to portray. I'll give you a hint as to what the plan is........it involves owl wallpaper and a cowskin rug. How baby friendly is that? I left Tony to pick out the proper bottles and baby bathing tub while I chose the cowskin rug. Hopefully in the next couple of months it will all come together because this boy could be here by August 1st! While 6 months is plenty of time to get accustomed to something, I am still amazed everyday that I am housing a small living creature. At this stage he has eyebrows and eyelashes and is starting to grow hair on his head. All while only being about 1 lb. I often wonder who this little boy will grow up to be, what traits will he take from Tony and what will he take from me. I still marvel at genetics....the shape of my foot is identical with my dads. Do I get nervous about life after the baby? Of course...I wonder how this will affect my new business, how it will affect the peaceful life that Tony and I have created for ourselves in our marriage, and if we'll figure out what the heck to do with our baby the day we bring him home from the hospital. But above the worry, I am thankful that I have Tony as a partner to go through the ups and downs with. We are also so fortunate to have family so close by. I think that is very rare these days, and I never take that for granted. Another member of the family who will have to adjust is Olive. She has already had to learn that she can't lay on my stomach anymore. I've told Tony that we will have to put a new bed for her in the nursery, so she doesn't feel left out.........I think I got an eye roll for that one. Spring is finally here (for most of the country)! If you live in Florida like me, it's been Spring for quite some time now. This season is about new growth, starting fresh and spending more time outdoors. As far as starting fresh goes........this can mean a lot of different things; taking on a new challenge, cleaning the crud out of your window panes, or updating your wardrobe. Or a bit of each! Nothing freshens your look like a new handbag. It can be the color pop that your muted outfit is in desperate need of, or the sophisticated and unique piece that makes your tired old jeans look fresh again. The hottest colors for spring are what I call, vibrant pastels. Lilac, seafoam and cornflower blue mix amazingly well with apricot, vivid lime and coral. These standout clutches are created from the softest Italian lambskin and made in the USA. These colors are limited, so get your favorite (or two) now, and start the season off with a punch! As this Holiday shopping season is coming to a close, I'm happy to report that the 1st collection of C.Blau handbags is almost entirely sold out! I have a few left if you would still like to get one in time for the holidays. I can have it wrapped in burlap and ribbon and sent out wherever you would like. I've received some great feedback about the bags, and was recently blogged about on Radar To The Scene She reviews all things fantastic and has a lot to say about beauty products, fashion, food and music. Also, my good friend Lindsey who moved home to Omaha, Nebraska and opened up her dream store Piper, is selling C.Blau handbags. If you're ever in the Omaha area, be sure to stop in and check it out. She recently starting selling online, so if you don't happen to be local you can still buy! She has a great eye for the unique and special and gets a lot of emerging designers in her store. Check out what she had to say about C.Blau in a recent blog post. I will have the Spring 2013 collection of C.Blau handbags ready by late January. Keep posted for potential online shopping available in February! I'll give you a sneak peak at the design process/colors in future posts. Stay tuned! This has been a long time in the making. I've gathered my experiences and honed the skills I've learned from previous jobs. I've taken a bite out of life and gone for a passion of mine. I've created and designed a line of leather handbags. The bags are manufactured in the U.S.A. and stamped for approval by yours truly. No seriously, I've hand stamped each bag with it's own number, so your number will only be your number. As you know by now, I'm infatuated with color. The leather colors for this first collection are beautiful and vibrant! 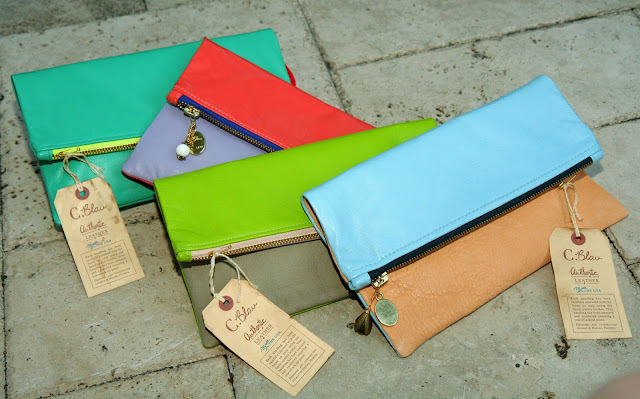 These clutch handbags are available in solid colors and two-toned. You can view the C.Blau website here. For now, I don't have a online store through the website, but email me at christina@cblau.com and I would be happy to make payment arrangements and send you a clutch! These bags are made in limited quantities and the colorways will be constantly evolving. I'm always expanding and trying out new things in the garden. My latest kick has been trying out a butterfly garden. It's very simple in fact, the butterflies do all the hard work.....all you have to do is provide the right plants. Butterflies need two kinds of plants in order to reproduce and inhabit your garden. The first is nectar plants that will provide a food source for the butterfly. The second is a host plant in which the female butterflies will lay her eggs and caterpillars will hatch. The caterpillars are hungry buggers and will devour an entire plant stalk in one day. I learned the hard way and planted my milkweed (host plant for a Monarch butterfly) front and center in the garden. I wanted to be able to watch them from the living room window. Well, I watched them all right.........I had ugly sticks to look at within a few days. I replanted them at the side of the house where they are semi out of sight. The image to the right is a swallowtail butterfly just hatching from it's chrysalis. The caterpillar feeds on the Passion vine. Below are some pictures of the Monarch caterpillar eating it's way through the Milkweed plant. As I said, not exactly pretty. After about 10 days, the caterpillar wanders off (sometimes 20-30 feet!) and finds a safe place to form a Chrysalis. It is sometimes difficult to find them. This is where it will hang for about 5 days. The Monarch chrysalis changes colors over those 5 days. It starts out a bright jade color with gold metallic flecks. Everyday it darkens more and more until it looks almost black. Every butterfly species has a different looking chrysalis. The Swallowtail's looks like a crispy stick. I think the Monarch's is by far the prettiest. Once it hatches, it will look for nectar plants to feed on. Then the process starts all over again and the female will lay her eggs on the milkweed. During the months of July and August there would be at least 3 different butterfly varieties constantly fluttering around the garden. It was really cool to witness and I was constantly yelling for Tony to come out and look at all our butterflies......yes, I did call them "our" butterflies. I guess I got attached. This would be a great project to try with your children.......or for yourself if you're a child at heart like me. I just wanted to send out a sneak peak of something that I've been working on. I'll give you a hint....it involves leather and zippers. If you can read tiny print, the text at the bottom of the tag will give it away. More to come later next month! Alright, I know I said before that figs are my favorite fruit. Well, I take that back.....since moving to Florida mangoes have moved up the rank to No.1. I know what most of you are probably saying, "I don't know if I really like mangoes" or "I would never think to buy a mango". Well, you are probably saying this because you haven't ever had a FRESH mango. Like just ripened and hot from the sun. From your backyard. As far as I'm concerned, if you live in Florida and don't have a mango tree growing in your yard, you are doing yourself a disservice. When you buy a mango from the grocery store, I don't think you get a choice of what variety you're getting. You're just getting a mango that has been shipped in on a food truck. In Florida, when buying a mango tree there are many varieties to choose from, depending on the size yard you have, to the flavor and how early they ripen. Check out this helpful link to view the mango varieties. I bought a Glenn Mango, mostly because it is fiberless (you don't want a stringy mango), and because it is a smaller tree. Glenn mangoes have a very sweet, almost "peachy" flavor. I got the tree a couple of years ago, so this was our second crop (if you could call it that). We had 7 mangos........count it 7. Tony and I knew it was 7 because once they started growing we checked on them everyday. Last year we lost a couple to some opossums. When you only have 7 mangoes a year, you are very selective on who you share them with. Hopefully in the next few years we'll have an abundance and be able to share them with our neighbors. So, what do you do with a mango? If you are like me, you stand over the sink and eat it like a barbarian....juice running down your chin with a happy grin on your face. It is just that good. Mangoes make a great salsa over fish. Just chop it up with some jalapeno, red onion, cilantro and lime juice. Since I only had one mango left, I decided to use it in a salad. I think this simple salad was one of the best I ever made. In order to get to the edible flesh of the mango, you need to peel back the outer layer. I find this is easy to do with a sharp knife. The mango has a hard seed in the center. I find it easiest to just start shaving off chunks around the seed. Then chop the chunks into your desirable size. I like a big bite, so mine stay large. Make the dressing directly in your salad bowl. Add the olive oil, vinegar, red pepper flakes, sugar and salt and pepper. Whisk this together pretty well and adjust to your own preference. I love the bitter taste of baby arugula. I think it balances out the sweetness of the mango. The red pepper flakes add just enough heat. Add fresh grated parmesan cheese, and that's it. You're done. You won't believe how much flavor comes out of that simple salad. So hopefully at this point I've perked your interest to go out and try a mango. Unfortunately, if you live up north, don't make your mind up completely until you've tried one straight off the tree. I promise you won't be disappointed. Most of Fiona's movement during the day is following the patch of sun through the dining room windows. By the time we get home from work, the fur on her belly is hot and she is purring and stretching in contentment. If you ever need a lesson in relaxation, adopt a cat. They seem to understand the epitome of letting everything go and just be content to lay in the sun. After all, isn't this what summer is all about? Yes, I like strawberries, and raspberries. Oh, and blueberries and blackberries are delicious as well. But I LOVE figs. These late summer fruits are abundant up north in Southern MD. In fact, I have a great friend in NY who's family hosts an fig-inspired meal every summer. Fig Fest has become a popular event and grown in size since it's inception 4 years ago. The family has a very large fig tree on the side of the house that has inspired and produced the fruits for the day. The beauty of the fig in my opinion is it's diversity in complimenting many flavors. It's great with meat, on salads, or canned as a preserve. The picture to the left is my Brown Turkey fig tree. It's not ripe yet, but when it does ripen, the color will be a brown, purplish color. The hard part is keeping the birds, opossums and other animals from eating them before I can. Chop your bacon into small pieces. Add the olive oil in a small skillet over medium heat and render the bacon until it is nearly crisp. Pour off half the fat, and add the onion, rosemary, thyme and salt. Cook, stirring often, until the onion is soft. About 3 minutes. Cut the figs in half and press your thumb into the center of each half to make a small depression. Arrange them face up in a shallow glass baking dish. Add a spoonful of filling to each fig, making sure to cover the top. Crumble the goat cheese and place roughly a tsp on each fig. When ready to serve, bake the figs until just warmed through, about 5 min. There is something very satisfying in growing your own food. For one thing, you really can't get anything more fresh, but even beyond that, it's the fulfillment of knowing that you tended to it and grew it on your own. One of the easiest ways to get started is planting herbs. You can plant your herb garden in a raised bed like mine, or if you're low on space, simply plant your herbs in small pots where you have room outside. For today, I decided to focus on Oregano. As you can see from the picture to the right, it's pretty just to look at without tasting! I have found that it is very easy to grow and you can add it to many dishes. I think it has a woody, earthy flavor that goes great with tomatoes. If you're like me, you can eat tomatoes anytime......marinated in a vinaigrette, stewed in a marinara sauce, or just eaten like an apple with a pinch of salt! One of my all-time favorite ways to eat tomatoes is when they're roasted. I have adapted this recipe from my mom. It's easy, delicious, and uses a lot of oregano. It's perfect as an appetizer, but my husband and I end up eating it for dinner or even breakfast. Preheat your oven to 350. Remove the stem and cut your tomatoes horizontal into 3 slices for each tomato. Lay them into a glass baking dish and pour your olive oil evenly on top. Sprinkle salt, sugar, fresh pepper and oregano evenly over the tomatoes. Slice your loaf of bread and put on as many tomatoes that you can fit! I put a little shredded Manchego on top for kicks. Pair this with some wine and you've got yourself a treat! Another way to use oregano is in dressings. I don't think I've bought salad dressing in 3 years. It's so simple and much cheaper to make your own. Here are two dressings that you could try! Put all ingredients in a food processor. This is great on salads, but would also be delicious over chicken. Whisk everything up together, and you're done! I hope everyone is inspired to go out a plant some herbs. Start small and try out some recipes, or just make some up of your own! I promise that is won't just taste good, but it will feel like you've accomplished a lot.